Aydat (unit) Levi’im can do just about anything that they put their minds to. This past Friday for example, the kids had an awesome time playing basketball and relaxing post-Powderpuff. We also started practicing for Rikudiah (our camp-wide dancing competition this Wednesday)! At this point, I probably don’t have to remind you of the sheer joy we experience here on Shabbat. You’re almost surely aware of how deeply affected each chanich and chanicha (male and female camper) is by every second of rest here at Yavneh, and how it constitutes a rest unlike any other, a taste of another World. Suffice to say, we were all marked by this day together, just like our other days at camp, even though Shabbat is a day apart from all other days. On Saturday night, the chanichim spent some time with the Kere m (the oldest aydah in camp and CITs). Sunday was just like our other days at camp, with a normal (STUPENDOUS) morning of kitah (class), schiah (swim), and chug (elective), and an afternoon of Rikudiah practice and aydah-wide football. An early BBQ dinner only added to the fun of that night’s activity: watching Arts Fest, a festival where Yavneh and 6 other Jewish camps performed a set of songs and dances!! Brave Leviim chanichim climbed ropes, faked swimming, and danced while wearing shirts with lights attached to them, among other things. Watching the other camps perform helped us realize how unique and powerful our e xperiences are here: we truly are being fulfilled day by day, moment by moment. 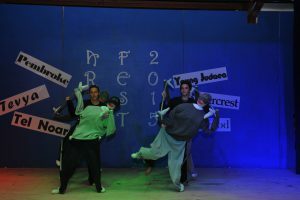 Our camp’s performance was clearly the most polished, used the most Hebrew, and showed the care and pride that we take in everything we do here at Machaneh Yavneh. We fell asleep soundly, ready to face a new day.